Found on the eastern shore of Lake Washington, Bellevue is a large city of more than 100,000 people, and serves and the center of the upscale Eastside region of the Puget Sound area. Although it has something of a suburban feel, Bellevue is home to plenty of growing companies and a booming downtown area. Consistently ranked among the best places to live in the entire country, there is a long list of things to like about this lovely city. As you might expect for an area that is so attractive, the cost of real estate in Bellevue can be quite high. The median home price among the MLS listings is over $500,000, and large single family homes can cost well over $1 million. Downtown Bellevue has a number of condo buildings, but the majority of the city to the east of I-405 is made up of single family houses. Not only is Bellevue a beautiful place to live, but it also provides access to the many tech jobs located on the Eastside – no doubt a factor in driving home prices higher. When it comes to activities and things to do around Bellevue, the Bellevue Square area is usually near the top of the list. Bellevue Square is among the largest shopping and dining centers in the Pacific Northwest, and is popular with residents from all around the area. This district in Downtown Bellevue has been recently renovated and revitalized, and comes alive especially around the holidays. 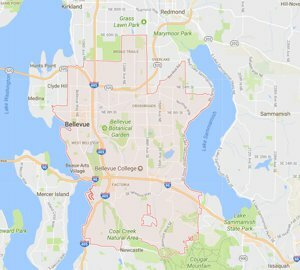 The location of Bellevue compared to the rest of the cities in the Puget Sound area is one of the things that makes it so desirable. Many residents work in Seattle but commute across Lake Washington via either the I-90 or 520 bridges to enjoy the quieter lifestyle on the Eastside. Access to nearby cities such as Kirkland, Redmond, Issaquah, and Sammamish is also easy when living in Bellevue. The opportunity to live in Bellevue is one that few people pass up when they get the chance. Since it is a large city, there tends to be a number of homes for sale at any given time, so a buyer should have a nice selection to choose from. However, this market is highly competitive and homes often sell for a premium because of their location. With access to the rest of Puget Sound and plenty to do right within the city, Bellevue is among the best places to live for a reason.